Well Happy New Year fellow crafters! Thank you for popping in from Stamping Ground. It has been quite a while since I last blogged with one thing or another (including another house move!) but now I am back. As for a work desk well this can be found in one of two places - dining table in the kitchen or my desk in the lounge. So this picture is of my desk in the lounge. Looking very tidy (compared to normal)as I have just finished crafting for my blog and about to get ready for next weeks craft projects once I have completed this post. Drinking Options White hot chocolate as determined to lose weight this year. Hubby (shoulder/elbow top left of piccy) has tolerated my desk being put in here as it means he can natter to me whilst watching TV. So I am happy... well until he moans "you just missed that cause you weren't looking again." hee hee... I'd worry if he never moaned! Hope to see you again next week. 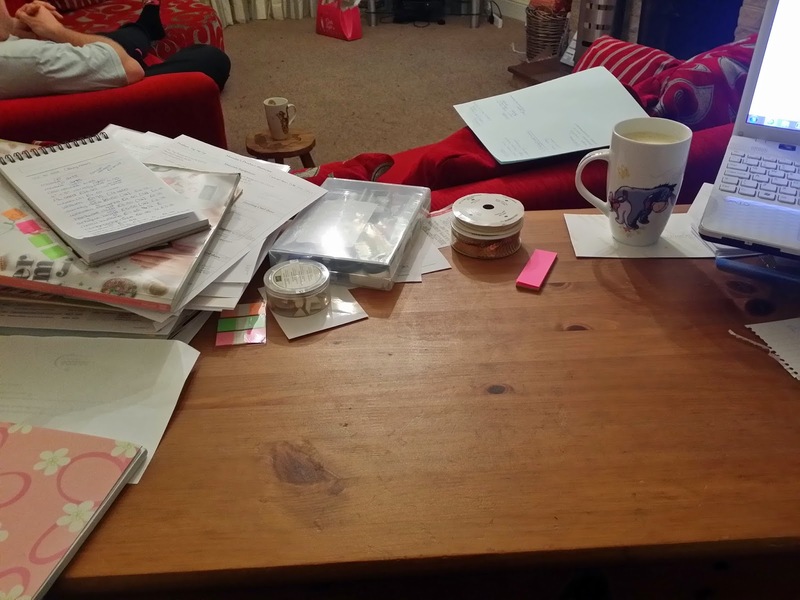 I love a neat and tidy desk, just a pity I never seem to manage to keep mine that way. I would be too distracted with a husband AND a TV in my crafting space!! Lovely cards and layouts in the newer posts! I enjoyed the latest cards you made in the posts above. Just goes to show what happens when you are late visiting. Like you, it's been awhile since I visited deskers, too. But mine was not due to a move. Hope you are now settled into the new move and routine. Happy belated New Year and happy belated WOYWW from # 2. I feel the need to be within nattering distance but have to have my back to the tv...not that we talk much even when we are watching together!! I've changed the link that you used on WOYWW to bring the visitor directly to this post..linking to your blog address only brings people to your latest SU! 'advert' post and it looks as though you aren't doing WOYWW just linking your business.